Last week, or maybe the week before, it rained and rained and rained one night (I can’t remember which night because that sort of thing happens a lot here), and it was dark out and nearly bedtime, and I had a lot to do, book-wise, and I was dead tired after work and we all could have just endured a few more episodes of Octonauts, but there were big puddles outside. In Vancouver, if you don’t look at a puddle as an opportunity, the time between summers can be pretty bleak. 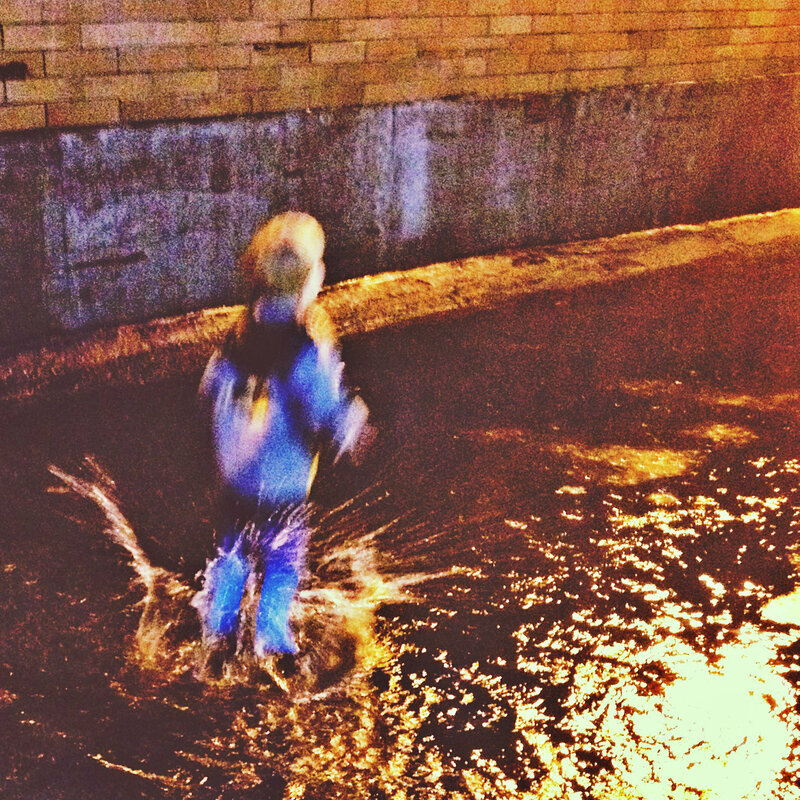 So I had Nick shove Toddler’s feet into his boots and button his raincoat while I shoved my own feet into my own boots, and we clomped outside to splash around in the water under the orange glow of our street lamps. We rounded the block twice, and on the second go-round, Toddler announced that he’d like hot chocolate, “with march-mellos.” Who am I to refuse such a request? I can never say no to a marshmallow. So we splashed our way to the grocery store just down the street, and we marched to the back of the store where the marshmallows are kept beside the ice cream freezers and sundae toppings, bought a big bag of white mini marshmallows, then came home to make hot chocolate. By the time Toddler was in his jammies, I had his hot chocolate in his dinosaur mug, heaping with marshmallows. We drank our drinks and read some books and we all went to bed pretty pleased with ourselves and our sound decision-making. Fast forward a few days or weeks, and I still have a huge bag of mini marshmallows. And Nick, with his diabetes, has gone off to the woods outside of Princeton to shoot our year’s supply of meat. So Toddler and I are alone, free to raise our blood sugar and rot our teeth unencumbered. I’m using up the marshmallows. Toddler’s pretty pumped. This is a spin on a bake-sale classic, improved by substituting white chocolate chips for butterscotch chips. The result is kind of like tiger butter, only with marshmallows. I used the microwave for this because it somehow felt wrong not to. Toddler and I are going to spend our weekend together eating these in a blanket fort while watching the whale shark episode of Octonauts over and over and over until the sugar knocks us out. You should definitely lick the spoon. Put the butter and the chocolate chips in a large glass bowl. Microwave the whole thing for 30 seconds. Remove the bowl from the microwave, stirring the mixture well, then return it to the microwave and repeat this process. Add the peanut butter, stirring well. Microwave for another 30 seconds, before removing the bowl stirring well, and repeating the process once more. When the chocolate chips have melted and the mixture is smooth and creamy, add the salt and vanilla, stir again, then set the bowl aside and let it rest for a minute. Lightly grease a 9″x9″ baking dish and line it with parchment paper. 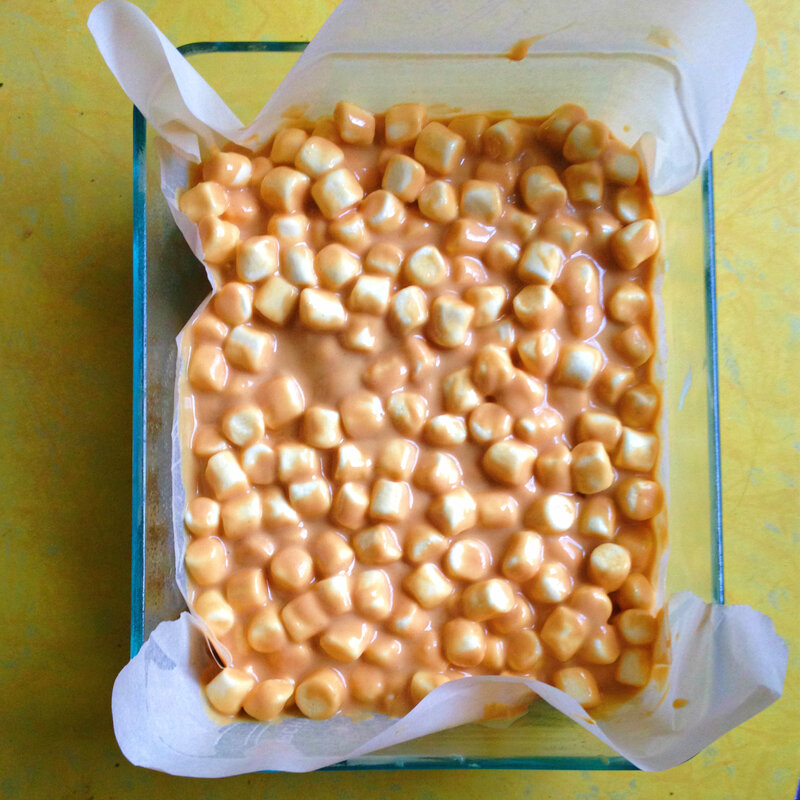 Stir the marshmallows into the peanut butter mixture, and then pour the whole thing into your prepared pan. Refrigerate the mixture until it’s firm enough to slice, at least two hours. Cut into small squares and serve. This is great for bake-sales, treat tables at holiday events, and on plastic Buzz Lightyear plates under a fort made of blankets. Next > Coconut caramel pound cake. Holy Toledo! These look amah-zing. I am such a big fan of the traditional peanut butter marshmallow squares and this brings it to a whole new level of happiness. I think if I started giving these to my clients, I’d go out of business!